If you can’t have the retirement of your dreams in the U.S. or Canada, you can have it somewhere else. Just the other day my retired friend who lives in Manhattan lamented about the cold and how it’s a little more difficult to get around. She wonders what would happen if she lost her mobility because she loves exploring the nooks and crannies of the big city. Her tiny one-bedroom apartment in a very tall high-rise is cute, but expensive to maintain and she’s starting to feel closed in. However, if she chose to retire in Nicaragua she could create a dream life she never even considered. Think living near the beach is out of your reach financially? At home it may be, but not when you move abroad. San Juan del Sur, Nicaragua, offers the proverbial beach-town lifestyle with all the quirks, colors, and fun that you saw in those 1960s surfer movies. Worldwide, Nicaragua is still in the running for some of the most economical homes near the beach. San Juan del Sur is a tiny and very colorful three-square-block town, but it’s loaded with restaurants, surf shops, shuttle services to other beaches, beachwear stores, live music, and more. You can hear the waves crashing almost anywhere you walk. It’s a dream life. And it can be yours for a song. If you want to rent without needing a car, there’s a beautiful, well-appointed one-bedroom house that just came on the market for $500 a month, including all utilities and WiFi. Located on the main drag that goes into town, a five-minute walk will get you anywhere you want…including the beach. With a front and back patio this house would be great for a single retiree or a couple. If you are looking to buy, you can’t go wrong with this $149,000, ocean-view, two-story, 1,250-square-foot home at Maderas beach—our famous surf beach where they hold international surf competitions. One of four detached homes, it comes completely furnished, with granite countertops, beautiful hardwood finishes, and well-appointed furniture. With a sweeping view of the ocean from the patio, you can while away the hours in your own private heaven. 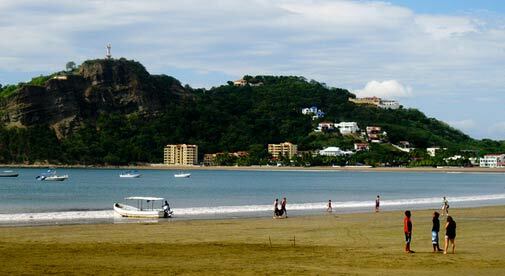 San Juan del Sur is experiencing a construction boom right now. According to the local government, over $200 million dollars will be invested in the next few years to bring this once-sleepy fishing village up to world tourism standards. If you are “on the fence” about moving to Nicaragua, I urge you to take your next vacation here—and see if you can find your retirement paradise here. I did, and I’m sure you can too. Where Are the Foreigners Retiring in Nicaragua Living?